List some challenges that sales managers face in tracking team performance. Explain how Einstein Forecasting can reveal how sales teams are doing. You’ve come a long way. You’ve learned how Einstein can automate many of your reps’ activities and help them target the best leads. You’ve seen how Einstein can provide key insights to help Honeydew’s sales reps close more deals and stay up to date on important accounts. But what about the bigger picture? These Einstein features are valuable for applying AI to individual deals, but it would be great if Einstein also provided more high-level info about how sales teams are doing. What about seeing the forest for the trees? You realize that having such big-picture insights would be especially useful to Honeydew’s sales managers. They would love to have predictions about sales figures in advance, so they would know where to focus and possibly intervene before teams miss their sales quota. You’re sure Pepper and the other managers will be completely sold on Einstein after they hear what it can do for their sales forecasting predictions. Suddenly, you hear a knock at your door. It’s Pepper Black, one of Honeydew’s top sales managers. She has more flecks than usual dotting her brow. Her teams are thrilled with how Einstein helps them target and close their deals, but for managers, getting a handle on the sales team’s deals is challenging. With so much noise, it can be difficult for them to know when to step in to help. Pepper can see even more detail on the forecasts page. 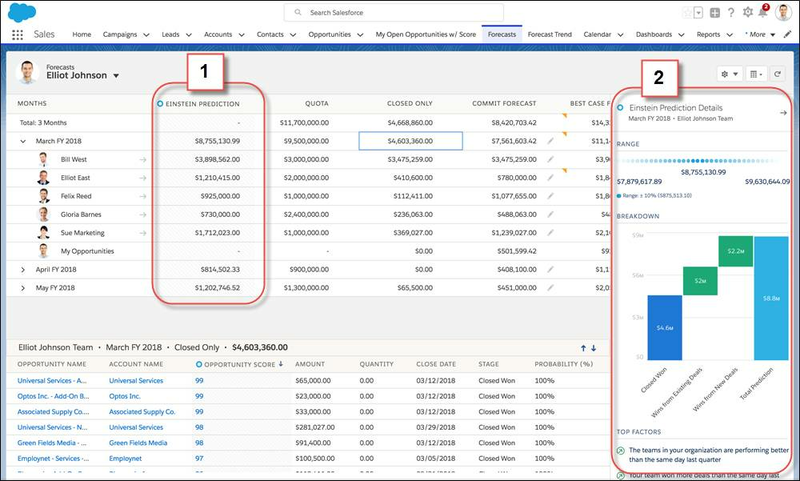 List views display the Einstein prediction amount broken down to show the median predicted amount for each of her sales reps and sales teams (1). Einstein bases the predictions on all open opportunities with close dates by the end of the month. Pepper can check the Einstein Prediction Details panel (2) to see more details related to her teams’ deals. 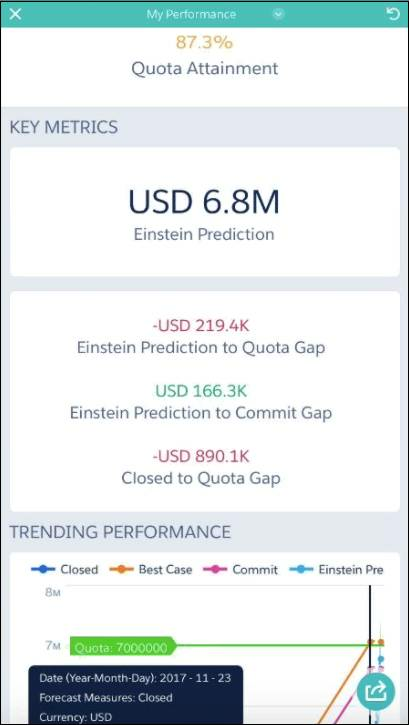 They include the range of prediction values, a breakdown of open deals in different stages, and the top contributing factors to the Einstein prediction. And that’s not all! She can also access some Einstein Forecasting information on the go. Using the Analytics app, she can see key performance metrics and the prediction graph on her mobile device. Pepper’s thrilled and does a little dance. You smile between sneezes in happy agreement. So now you’ve seen how artificial intelligence can optimize a sales team. You’ve seen how Sales Cloud Einstein, in particular, takes busywork and guesswork out of the sales process and replaces them with productivity and insights. AI will never replace the sales teams, but it can make them smarter at every step of the process. Use these resources to learn more about Einstein Forecasting.